Player has duty of lightguard, tedious task with forgotten meaning of purpose. Light the sky, but what for? Messaging, cultural ritual, or more? You have been summoned to take care of the lighthouse as former light guard has grown old. We have always followed the lead of the East lighthouse and kept the same color, never failing to do so. The West tower has always ensued us, sure to bring honor with their swift response. Be sure to hold your spirit high and keep the light bright! The game is also playable with Android! (Change filename to Lighthouse.apk, and it should work. Somehow changed to .zip file after upload). But game is designed to be played with computer. Graphics, music, sounds and coding was done during jam. You know, it might be appropriate to say that, but when I checked what games you did in the previous gm48 editions, I was surprised to see that you were the person who did that 3d door game, the other with the fire thingy, and also the troll games. I mostly remember the troll games, as they had an interesting concept. But it seems these 4 games (Cause I only played those) have something in common: they seemed to be too ambitious for the jam. For Lighthouse, it seems that you aimed for something less ambitious, with a smaller scope, to adapt it to the 48 hours time limit. And I think this shows, because this is one of the most interesting gm48 games I have ever played. The atmosphere, aside some small bits (not a fan of the "happy" sound the player makes and I found the weird whispers more annoying and distracting that they were bringing more the atmosphere), is pretty there. The art is super nice and unique. It has a "dirty" look that accomodate your time frame while still being interesting to look at. (Just not a fan of the quality/resolution, it seems that some of it is... kinda crushed or something, but it didn't feel optimal). The way the light and colors are organized is just perfect. I also love the concept of the environment, where you're just in one place each nights. It's also interesting how you simulated waves hitting the rocks in the easiest way possible. It looks a bit messy, but it definitely works. I also love the crawling menace and how the far lighthouse was blinking all colors before stopping to display any. This was an interesting foreshadowing for the next night. I was about to do something in real life when I noticed the monsters and felt very concerned! I love how they were just creeping there and how the boss is just a face behind the wall. Though I am not a fan of the fight itself, but I like that you fight while pressing the button for the light. Thank you for your thoughtful feedback :) Indeed, I have had ambitious projects, but I like to try push my limits. Though Underworld and first Troll game were finished, the most of my jam games aren't. In this jam Lighthouse was trying to achieve experience, just without knowingly do that - build up tension and be bit spooky, without making jumpscares. 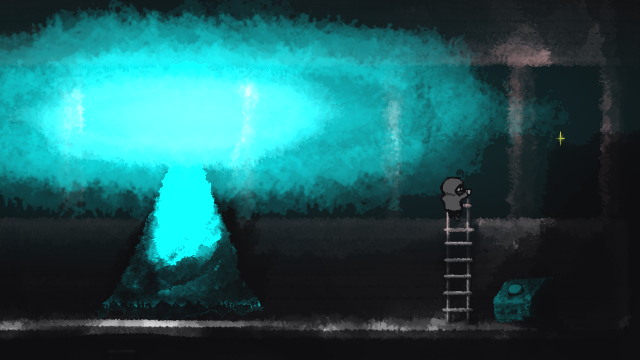 I had big plans here too, make many small things to interact and tell the story, make large-scale boss battle, where you would also had to use those two ladders - maybe break the light source with previously found pickaxe. But in the end I just made what I could and I am pretty happy with it. The game was already pretty gritty and dark, therefore I wanted make balance with player movement being fun to move around, and the sounds accommodate it - though it might not fit the theme perfectly. Also it would the running back and forth bit less tedious and repetitive. The resolution was trying to hid the already smudgy graphics and some ugly frames of player :,D But with smaller screen, like Android phone ('ported' wink-a-wink ;D ) it looks okay. The whispering noise, do you mean the waves hitting the rocks? I tried, but couldn't make any better, I just made some noise on microphone. But about feeling and experience; downside of this game design is, if player is not taking attention to small details, the experience is lost and the gameplay itself is shallow - no real platforming or puzzles. Did you try putting wrong color? There is monster waiting for you :P And it is in the color you should have put in, as they don't exist / aren't visible in right color light. I made small technical details, like how camera zooms out in the beginning when getting near lighthouse, or inside upstairs the camera keeps itself in between of player and light source. Camera tries to follow specific goal, but camera moves not by just lerping there, but lerps to values which are lerping to this goal :D Therefore it can't have any really sudden movements. You're a very interesting developer. 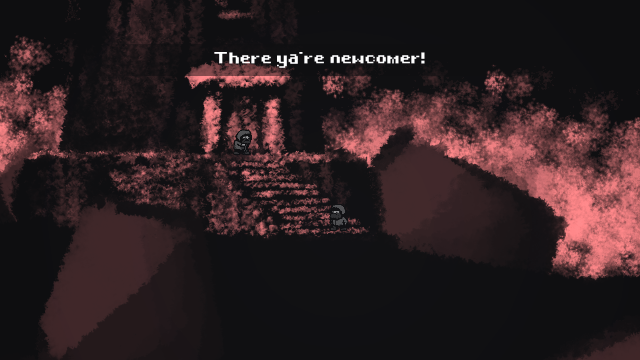 Really enjoying the atmosphere and ideas of your games! It also looks like your art is improving. Best art I've seen in GM48 so far. Well done! Would've wanted some more info on what's happening really. As in, could be a larger game maybe. Nice sound design as well! I really appreciate your feedback :) Background idea was, that for centuries there have been those monsters, lurkers, and light have been keeping them away. The monsters are there only in other light colors than they itself are, so they don't exist in red light if they are red. They get stronger in wrong color. The lighthouse defence line have been working so well that people have starting to forget why they are there, what's the purpose. The lightguards themself might or not remember, more important have been to do your job than understand why you do it. Now, the monsters have starting to adapt, evolve to accommodate the slow process of changing the light of lighthouse. Therefore they are constantly changing the colour in the last part of the game. If you keep close eye, you notice that lighthouse in background started to flash in different colours and go out. Someone did very same what you did, before they consumed lighthouse light. Player can subtly conclude, that the boss enemy was same that caused other lights go out, and if you did same what that other lighthouse, you did not kill or cause the big monster to lose, but merely get it weakened for next night. Great atmosphere. I absolutely loved the running and jumping of the lil guy. The sound effects that went together with it were great too :D It was fun just running around. The visual style was overall really interesting. Gameplay wise I didn't quite understand what I was supposed to do though. Maybe I missed something, but it wasn't clear what colour I should be choosing for the lighthouse and I lost on the 2nd night when a big creature was on the lighthouse. But still a fun little experience! Good job! Hey thank you for playing the game :) I tried to make controlling the character fun ^^ There is no function for crouching (maybe with more time in boss battle could have been), but I thought it was fun to have. I really liked it. Thanks for participating! Woah, very atmospheric! The dark musical tones followed by the crashing of the sea, it's really nice. I thought the art was fantastic and it really kept a good consistency. I thought the end boss was cool, I love a good boss battle, I also like that I was able to complete this game, as a few submissions I just couldn't. I think the things I'd change, is making the theme more relievant, currently you could take colors out of this game and it'd take nothing away from it. At the beginning I went right and nothing happen, I was a bit confused, no warning nothing, it would be nice to have an insight which way to start traveling first. I thought this made for more of an experience than an actual game, but nevertheless the art and sound direction made it a fun experience! Man I really love your games! The sounds and visuals work so well to set the mood, and the narration is pretty good. Seeing the 2nd lightouse flicker and go out really scared me ahah. This game really oozes with style and atmosphere. It might be closer to an experience than a game, but I really enjoyed it. I really liked the art, the waves crashing and the eerie music. The monster on the lighthouse when I failed night 3 was cool! Oh, and don't let me forget the great animation! I felt like I was playing the beginning of a popular indie game in the vein of Limbo or Braid. I'll admit I almost gave up during night four, but I figured it out on the 3rd try. The first time, I wound up jumping into the monsters mouth, oops! The monster was well done too! I don't have many complaints, the theme seems loosely tied in and the gameplay is pretty simple, but I can only imagine you had more planned -- it seemed like the game was supposed to last a week. But that's how these jams go. I can't believe this doesn't have more ratings already! This was such a good effort and deserves some attention! Really well done, Toru! Thanks for feedback :) About theme in my game, the monsters are only visible in other lights. You can't see red things on red light. The lighthouses are therefore line of defence, but purpose long forgotten, and monsters on 4th night have evolved to accommodate the slow reaction of lighthouses. In first days, the monster you see outside when you pick wrong color, it is colored same way you should have picked. Gameplay wise I wanted more, especially on Boss battle, that you can distract bass climbing to ladders, more variety of boss attacks and of course how to beat. In the end I had to cut it down :( I wanted more to be explored, things to be found storywise, so yeah you are right I had bigger plans ^^"
Oh boy this game was a suprise! I didn't realize it was a horror game when I downloaded it, because a lot of games from this jam are funny, colorful puzzle or action games. So, when I jumped into it, I expected something completely different. The sound effect of the crushing waves gave me goosebumps, the music, art and everything made me really uneasy (in a good way). I was getting suspicious. Superbly executed game, very polished! Impressive for 48 hours! Great art and nice controls. Very nice lighting effects. I thought it was a quality, immersive game, nice job! Very atmospheric game with great sound design and artistic storytelling. Had be gripped. Couldn't figure out how to get past night 4, but I really enjoyed this. EDIT: @Tero I did try that several times but it just created little colour orbs and nothing much seemed to happen! I may have to go back to see the ending now! Player has duty of lightguard, tedious task with forgotten meaning of purpose. Light the sky, but what for? Messaging or more?